To be fair to Lamb Of God, they once were a rather fantastic band, right up to (in my opinion, at least) and including Sacrament, fashioning a compelling post-Pantera brand of groove metal with artful songwriting to keep your head nodding and foot tapping. Around the time of Wrath something went wrong with the songwriting, however, and as Resolution proves, the band still haven't recovered, to the extent that full-length number seven sounds a bit dull - not a good thing for a genre of music so reliant on energy. If you've heard any Lamb Of God album before it, you've heard a better album; although things kick off at a high with screaming intro Straight For The Sun and the following Desolation, a high-energy riff-fest that raises your hopes, by the time you've got through first single Ghost Walking you'll be left with something of an 'is that it?' feeling. Ghost Walking itself is more than solid, an intriuging bit of acoustic guitar at the start leading into a catchy stomper that has something of the Redneck about it but is more than enjoyable. 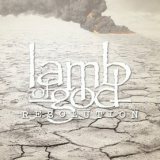 Elsewhere, however, things plod where they should overwhelm, yet there are positives, and it's impossible to deny that Resolution is at the very least a solid album. Randy sounds unusually vicious, even for him; perhaps buoyed by the lacking material his throaty rasp is throatier and more rasping than ever. I've long thought their frontman's fairly unique sound one of Lamb Of God's best features, and his performance here is typically stellar. He even tries clean singing on the nicely epic Insurrection, which works better than you'd expect. Yet aside from King Me's symphonic grandiosity, the likes of Guilty and Cheated are pretty standard LoG-by-numbers. Ultimately, Resolution is the sound of a band very nearly running on empty, sadly, that will need more than increased Pantera influence to stir up my interest again.